A Cycle Chic Classic. Girl executing right turn. 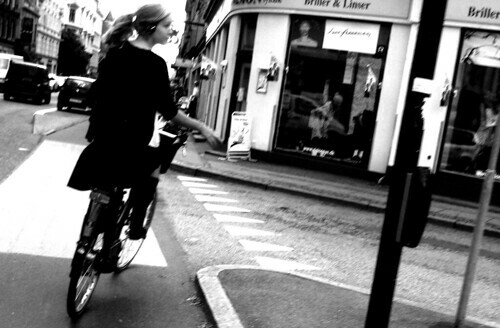 The Fashion Spot used this photo in an article entited:" How to look Stylish while riding a bike." It would have been nice and polite if The Fashion Spot actually linked to the photo at it's source, either here or at flickr. and what about crediting the photographer? It's a little hypocritical of them not to at least credit the source of this picture, because in the TFS Forums, they have a policy: " Sources / Credits for all Images Required." They will delete posts (and its pictures) if they are not credited. I wonder if you send them a note if they would delete their own article. I don't know how to contact them, and you can't post to their forums unless you are a member, which is by invitation only. They might be a little hard to contact.